Retrieving his belongings from his ex-girlfriends apartment, Sam (Anders Danielsen Lie) turns up just as his ex is throwing a party. Not quite in the party mood he shuts himself in a room and ends up falling asleep. When he awakes he discovers blood everywhere and the place seems deserted. He finds his ex who immediately attempts to attack him. Locking himself back in the room and looking out of the window he discovers everyone has been killed and have returned as zombies. Barricading himself in the apartment, scavenging and surviving on what has been left behind he believes himself to be the last person living but how does he know this for sure if he won't leave the apartment? I really like the way the zombie genre has been branching out recently. Yes, the mediocre Romero knock offs and all out action kill fests will always be about and as much as I do enjoy them they are beginning to get a bit samey. The viral outbreak movies are getting further away from the zombie aspect in the hope of angering less zombie fans so it's refreshing that it is making way for a more sensitive yet still very chilling approach. 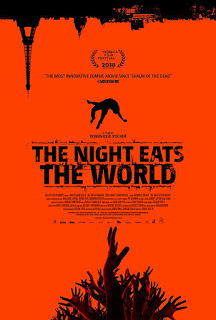 Like HERE ALONE, IT STAINS THE SANDS RED and CARGO, THE NIGHT EATS THE WORLD focuses on mainly one (living) character and how they deal (or don't in this case) with the terrifying prospect of life alone in an undead world. Sam is a very resilient and strong willed guy with a sad past yet manages at first to deal with everything in a relatively controlled fashion. He is not a hero he is just a normal guy dealing with loneliness, hunger, fear and total despair. There is a true sense of realism to his character, his mental state and the way he deals with his predicament is just fantastically portrayed. Music plays a big part in this too. The soundtrack is very emotive and prominent throughout plus Sam uses music to pass the time using instruments you would expect and some you possibly wouldn't. Another truly brilliant thing about this movie is the zombies themselves. Often with the quieter zombie movies there are only one or two zombies that are the focus. This one features swarms of them and the twist with these zombies is simple but really very unnerving. Keep an eye out for Alfred (Denis Lavant) as the most featured zombie, he is fantastic. They look amazing , a lot of detail has gone into them with some great make up, gore and wounds. The actors really get into it too with some wonderful jerky, disjointed shuffling and scurrying. These are the best modern type of zombie I have seen for a long time. It's safe to assume that I enjoyed this movie a lot, everything just fits with this and was I immersed in it right from the start. It might not be as lively as some but it has its moments, I did not find it boring in the slightest. 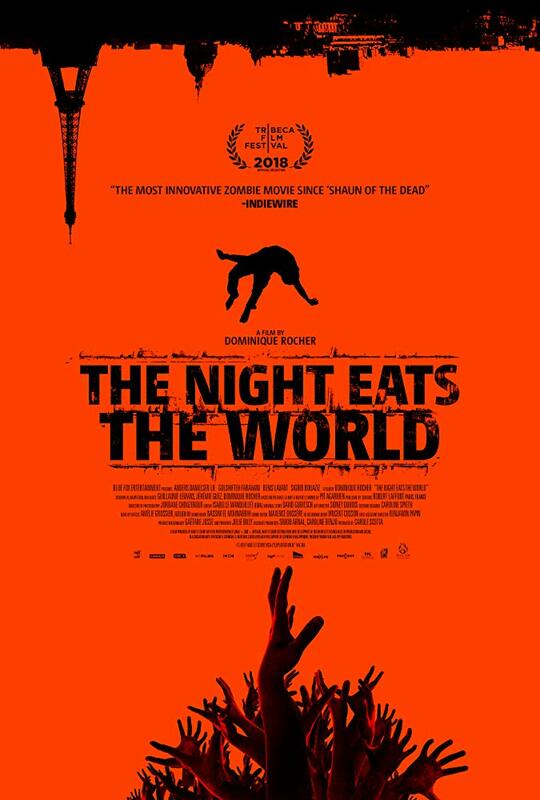 It's a beautifully shot and an expertly crafted story about the human condition put under extreme pressure with the added bonus of some incredibly cool zombies.